There are certainly some parts of your vehicle that do not need to be replaced immediately, once they begin to inevitably fail. Due to the integral role that it plays in regards to cooling your vehicle’s engine, a water pump is definitely NOT one of those parts. When a water pump fails, your engine becomes unable to cool itself as needed, leading to serious problems that can quickly snowball into a complete engine failure. Although the process of replacing a faulty water pump can be time-consuming and somewhat pricey; it is far preferable to the alternative of having to deal with a cataclysmic, total engine failure. Here are the top 6 warning signs that can help you identify that you have a bad water pump, before it turns into much more serious (and costly repair). The job of your vehicle’s water pump is to move coolant the radiator and around the engine to help eliminate any possible buildups of heat. Your vehicle’s engine is made up of hundreds of closely connected metal parts, moving at an extremely high speed. These parts will, invariably, come into contact with each other and generate quite a large amount of friction and, thusly, produce a high level of heat. When the buildup of this heat is not being properly dissipated by your water pump, the result is fused, warped, melted and broken engine components. One of the most obvious signs that your vehicle’s water pump is about to fail is a noticeable and consistent coolant leak that appears toward the front end of your vehicle. For example, if you leave your vehicle parked overnight and you notice a puddle of green or orange fluid (depending on which variety of coolant your system uses), it’s likely coming from your water pump. If your water pump has a slow leak, you may not notice any puddle of coolant underneath your vehicle. However, the coolant will slowly build up around the water pump itself, leaving a large amount of gelatinous gunk. You may also notice coolant trails that travel down from the water pump or even a build up of rust or other corrosion on the water pump’s mounting surface. All of the issues discussed above are symptomatic of a slow leak. 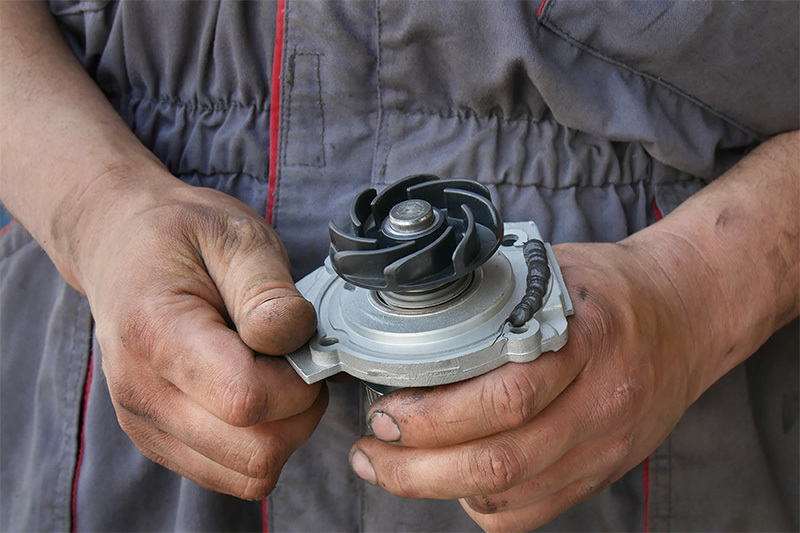 Although a slow leak does not mean that your water pump will fail in the immediate future, it will likely create a low-coolant situation that can result in overheating and damaged engine components. If you notice a whining noise that increases as you accelerate, a loose accessory belt is likely to blame and the fix could be as simple as tightening the belt or replacing the tensioner. If there is a grinding or growling noise coming from the front of your vehicle’s engine, the culprit is almost certainly a bad bearing. There are a number of other bearings on the front of the engine that can fail as well. Your best course of action is to take your vehicle into a mechanic as soon as possible to get a detailed and comprehensive diagnosis of the problem. After the water pump has already failed, your engine will overheat. If your vehicle has not exhibited any other symptoms of an impending failure, make sure you pay close attention to your “Low Coolant” warning light. If your “Low Coolant” light does turn on, pull over, allow your engine to cool down, add additional coolant as needed as soon as possible and check for a major leak within your system. If this does not remedy the issue, or if you notice your vehicle’s temperature gauge rises above normal levels, pull over immediately and call a tow truck. Continuing to drive your vehicle at an above normal temperature can have devastating consequences. If you notice smoke or steam coming from your radiator, or from under the hood in general, your engine is running way too hot. Unfortunately, at this point it is likely that your engine has already suffered serious damage as a result of the excessive buildup of heat. Your best course of action is to pull over as soon as possible and call for help. NOTE: Wait for your engine to cool down prior to attempting to diagnose the problem. The engine’s components and coolant are scalding hot, not to mention that the coolant is part of a pressurized system. Any release of pressure can result in a rapid expulsion of coolant that can cause serious bodily injury. Previous Previous post: What is a “21st Century Tune-Up”? Next Next post: Why Is My Car’s Air Conditioning Not Blowing Cold Air?